A former Public House/Inn built in 1890, Lion House offers Bed and Breakfast accommodation with four light and spacious rooms providing our guests with the highest levels of quality and comfort. Free, super-fast Wi-Fi is available throughout the entire building and outside areas. Ample free parking available and storage for bicycles available upon request. Come to Combe Martin and you’ll have all the ingredients for a perfect North Devon holiday, dramatic coastal scenery and lots to do nearby. Secluded sandy beaches and dramatic coastal scenery. For fans of the great outdoors, hike along to Little Hangman (the tallest sea cliff in mainland Britain), or follow the 230 hidden steps down to Golden Cove for some spectacular views. Situated on the South West Coast Path, Combe Martin is also home to several dog-friendly pubs and local stores; great for provisions along your journey. If you fancy getting out on the water, book a chartered fishing or wildlife trip (leaving from Ilfracombe harbour), or alternatively hire a kayak and take to the calm waters in the bay. If you’re bringing the kids, they’ll love the unique experience of the Combe Martin Wildlife and Dinosaur Park, where you can swim with sea lions, meet the meerkats and see the animatronic dinosaurs in action! The newly refurbished museum in Combe Martin is also well worth a visit, with a regular programme of exciting activities, creative workshops and fascinating talks planned throughout the year. Watermouth, Woolacombe, Saunton, Croyde, Lynton and Lynmouth are all popular places to visit in the area, Combe Martin Sits on the edge of the stunning Exmoor National Park. 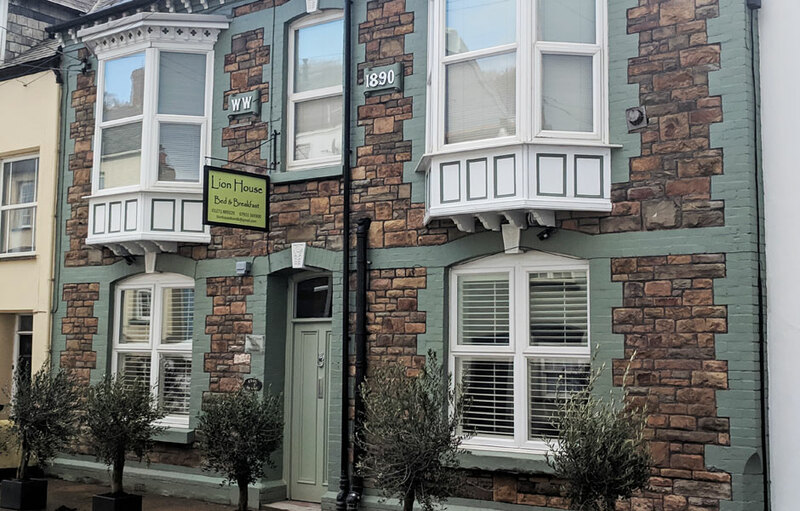 Whether your choice is to walk, cycle or drive, Lion House is here for you to enjoy a luxurious stay and as a base for exploring the delightful countryside, local beaches, historic sites, and Exmoor National Park.